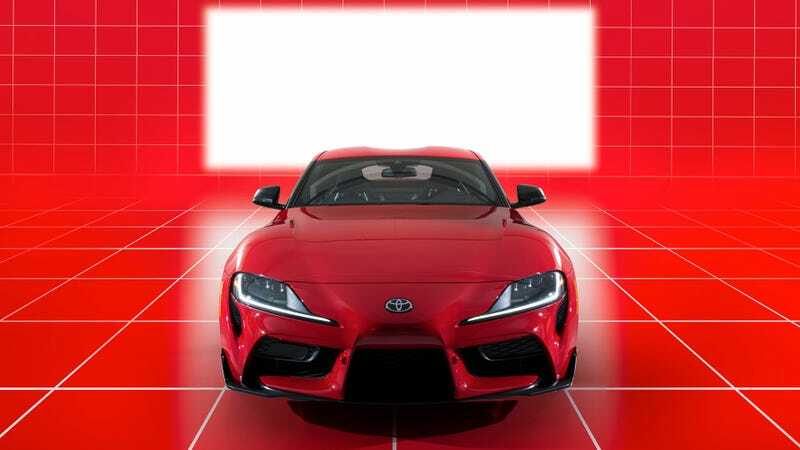 We’ve been ranting and raving about the new Mk V Toyota Supra for quite some time now, but it took until just now for me to realize that it’s actually quite an attractive design. The front-engine BMW-based Toyota coupe has good sports car proportions with a small greenhouse and wide fenders. It looks particularly good in this admittedly-not-real backdrop. It looks like a car from the future, and these backgrounds are like something straight out of The Matrix. The original images were photographed by Nick Pacione at Toyota’s facility in Texas. He then created the red room in Photoshop, while a Isaac Murray crafted the white room using Maya 3DS Max. I’m certainly not good enough at either to even begin to know how that process happened, but I applaud their collective efforts. Both backdrops give me a wave of nostalgia for a laser-background trapper keeper with a Lamborghini Diablo SV on the front. Weekend Wallpapers are usually featured on Sundays (but not always!). Got one you’d like us to run? Send it to bbrownell@jalopnik.com with the subject “Weekend Wallpaper.” Just make sure you have the rights to use it.